Markus Koppensteiner studies body movements of politicians, and how these affect people's judgements of politicians making a speech. 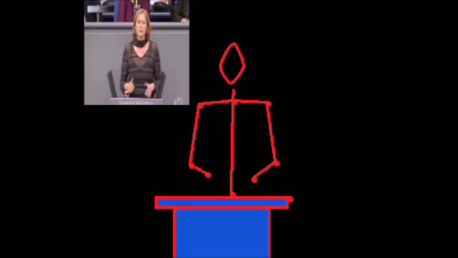 For this, he turns body movements of German members of Parliament into stick-figure animations - a time consuming piece of coding, but with beautiful results. “Politicians are not only judged by their abilities to present the contents of a speech, but also by their facial expressions, their looks and their movements. Such nonverbal cues convey interpersonal and affective information and often have a dominant influence on people’s judgements.